Sherry showed up in the comments here last year, and I was intrigued because she is a poet and I know absolutely nothing about poetry. (Besides limericks involving Bob Vila. shhh) I started reading her blog and suddenly I like poetry. Like this one. 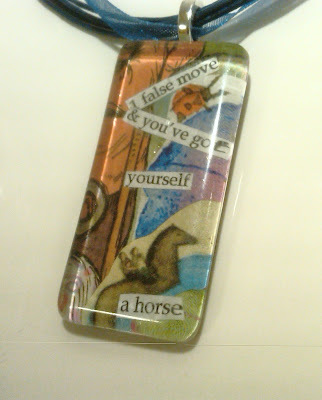 And she started making glass pendants that have lines from her poems on them. Done in paper collage..that she cuts out of vintage books and papers...and God do we know how much I love anything one might call "vintage". Now she's doing the glass tiles.. 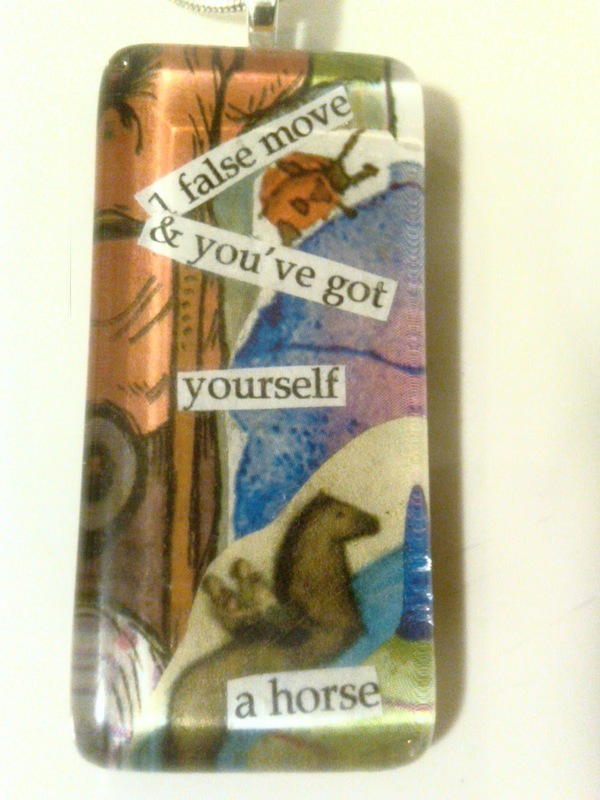 I asked her to make one out of this poem: "One False Move and you've bought a horse" - because I feel like I fell into this project on accident. So here we are. I've got myself a horse pendant. 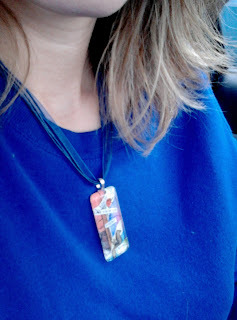 And an encouraging friend in Montana who makes art out of words! 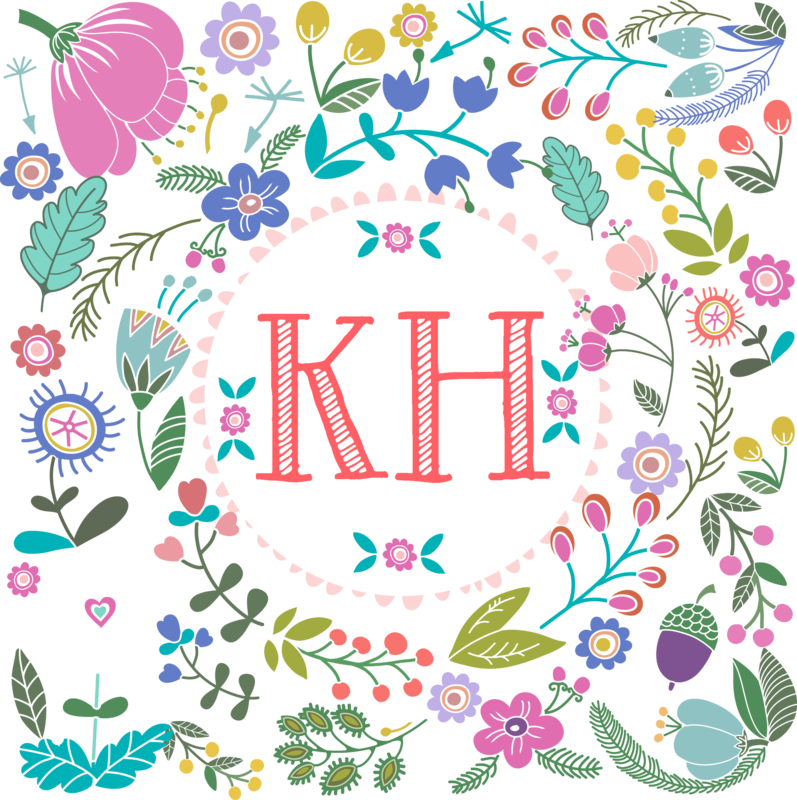 I've met an awesome bunch of people through this blog. I may have to offer one of these up for a giveaway - I've never done a giveaway before..how about this one? I love the horse one, how hilarious, and very fitting for your 'situation'! 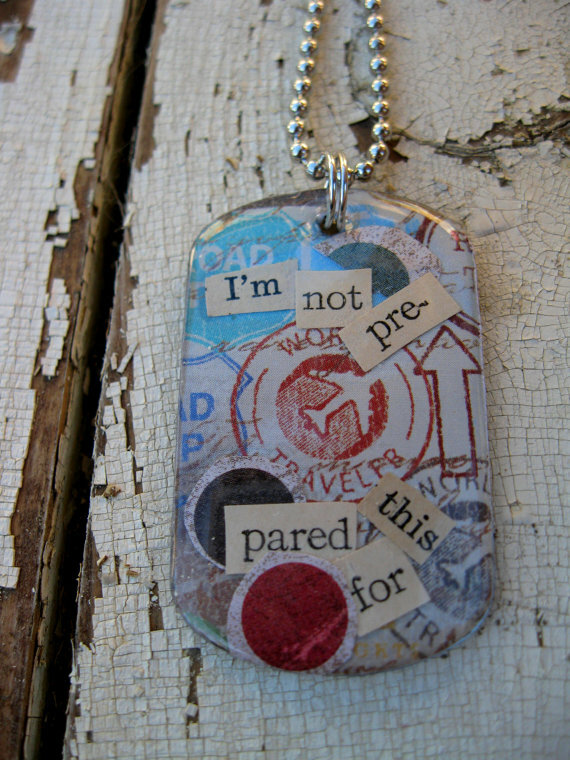 All the pendants are beautiful; the one that I like is "stay still". These are lovely! Thanks for sharing!. I like "Love, be a little kinder". I like all of them!- especially the one that says" stay still". Oh I never win a thing but here goes - I like the "be where you are" one. A good reminder for me. Oh wow ... 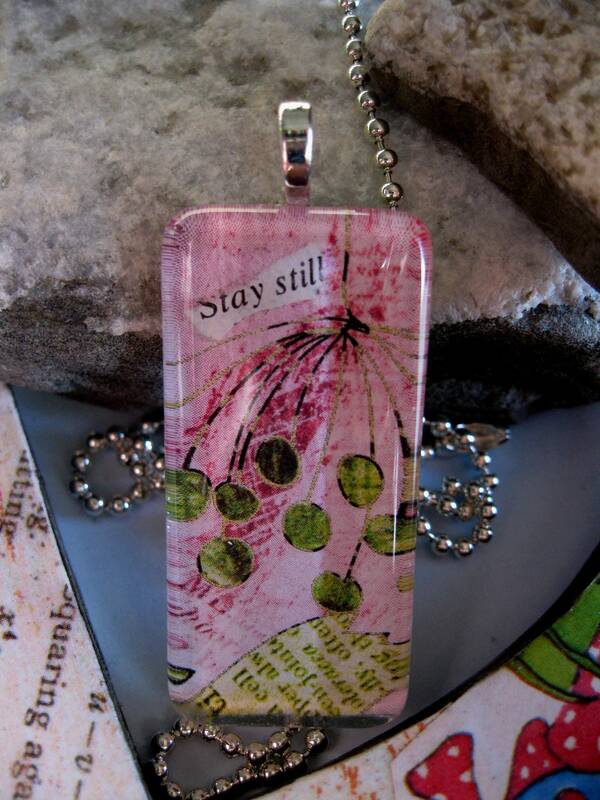 I love pink and green, and always need a reminder to slow down/stay still. 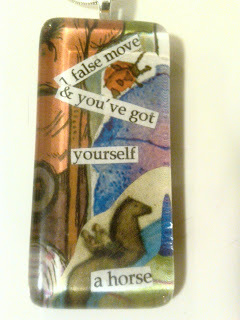 Also love, love, love the line "1 false move and you've got yourself a horse". Thank you for such a great giveaway! 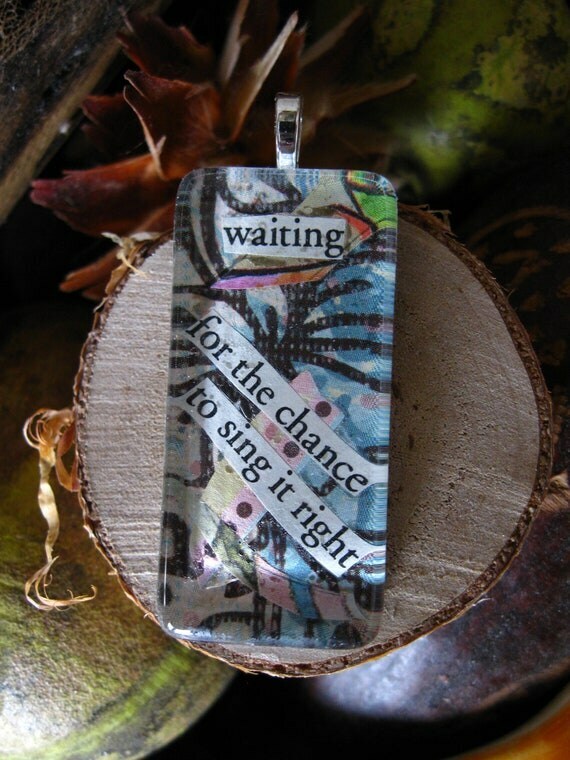 If we are saying which one from the Etsy page then Surrender is my favorite followed by Faith then Melody. If we are talking about the two on your page then Stay Still is my favorite. All of them are truly beautiful! Very Neat that you are doing this. Really cool pieces - art that you can also wear. So are you going to get a horse now? lol! I like the stay still one and know it's a lesson i am still trying to learn. Jenny and "Dee in BC" - could you please leave your email address here? You're no-reply and I have no way to contact you! I like the Be Still collages. There are 2, one pink and one yellow. Both are nice.